Which segments and applications are growing? What types of robots with which specifications will be on demand? 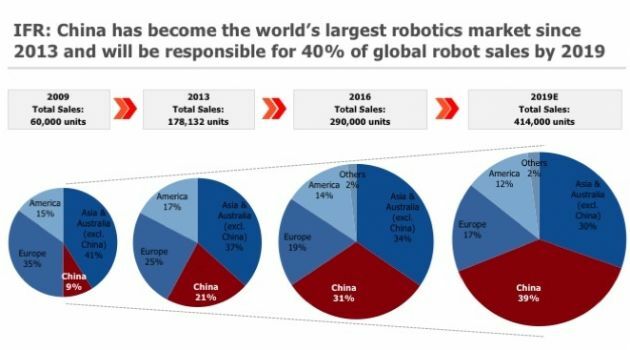 How is the share of foreign vs. domestic robots changing? How are domestic manufacturers catching up? What drives the domestic development? Critical acclaim of government plans: Will the growth goals of the 13th Five-Year-Plan for the robotics industry be achieved?How will the subsidies develop and which impact will this have on robotics sales? Scenarios for the expected market consolidation: How will this process look like? E.g. which standards are currently drafted by the government for the support of robotics companies? Which form will dominate – horizontal or vertical consolidation? In an extensive research process, we identified the relevant manufacturers of industrial robots (Multi-joint robots, collaborative robots, SCARA robots, coordinate/gantry robots, parallel/delta robots, AGVs). M&A, other important recent events, etc. Over 80 percent of the robots in the Chinese market are sold through system integrators. They are essential partners for vendors of automation equipment, as well as for manufacturing enterprises looking for the right suppliers to enable their automation projects in China. While most of these companies are small and very specialized firms, there have others emerged with several thousand employees. Some of them have set up branches in Europe and Northern America to serve their international customers overseas. 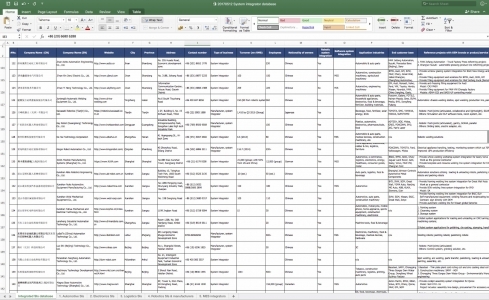 The database comes as an Excel file and contains 305 system integrators. Of them, 277 are active in the field of robotics, 72 serve robotics as well as various software areas and 23 are pure software system integrators. For a first glance, please see the following screenshot.